Dr. Abdulalim Abdullah Shabazz has dumbfounded those critics who disingenuously pretend that Africans are ill-equipped to master mathematics. This false claim runs counter to the historical record which reveals conclusively that mathematics originated in Africa. This historical fact is well documented by even Herodotus who, in many European quarters is called the "Father of History". There are at least 200 Black Ph.D.'s in mathematics. 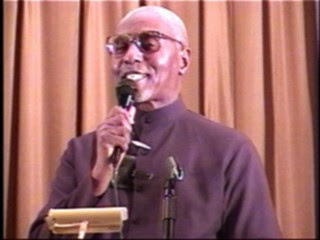 Dr. Shabazz is credited with educating half of them. This astonishing achievement which substituted multiplication for addition as a production mechanism has occurred during his tenure at Clark Atlanta University where he chairs its mathematics department. His achievements are being recognized by his peers. In 1993, for example, the American Association for the Advancement of Science, the world's largest science organization, awarded him its prestigious Mentor Award. The Quality Education for Minorities Network, in 1995 recognized him as a giant in science and for substantially increasing the number of Blacks in science and mathematics. Also in 1995, The Mathematical Association of America recognized his math department as one of the 10 top mathematics departments for College students in America. He was born in Bessemer, Alabama and was graduated with honors from the renowned Dunbar High School in Washington, DC in 1945. From Lincoln University, he earned an A.B. degree with honors in Chemistry and Mathematics in 3 years. His M.S. degree in Mathematics was earned at the Massachusetts Institute of Technology. He earned a Ph.D. degree in Mathematical Analysis from Cornell University. During his tenure as an associate Professor of Mathematics at Clark College in 1960, he joined the Nation of Islam and subsequently headed its educational programs. He has also taught mathematics at Union Al Qura University, Makkah, Saudi Arabia. Despite his unparalleled achievements, Dr. Shabazz came under fire at Clark. He was arbitrarlily removed from his chairmanship in July 1995 without his knowledge. He learned of the unilateral move in August 1995. In 1997, Lincoln University in Pennsylvania appointed him as Chairman of the Deparment of Mathematics.